Here we examine forcing chains starting from all candidates in a cell. When the number of chains is 2, there is nothing new. Above that, there is a new strategy to explore, which rivals LPO in complexity, but falls behind in the assurance of steady progress. This earns it a reluctant last place in the Systematic Sudoku Order of Battle. This simple AIC proves that either 3 in r1c2 or 9 in r5c2 is true, eliminating 3 in r5c2 that sees them both. Stuart picks the bv in r1c2 for his dual cell forcing chains, but the bv r1c9 and r7c9 could have served just as well. Any of the candidates on the almost nice loop could have been designated as starting points for digit forcing chains as well. Cell and unit forcing chains offer a new solving technique when there are three or more chain starting candidates. If all chains wink on a candidate, it is false. If all slink on a candidate it is true. 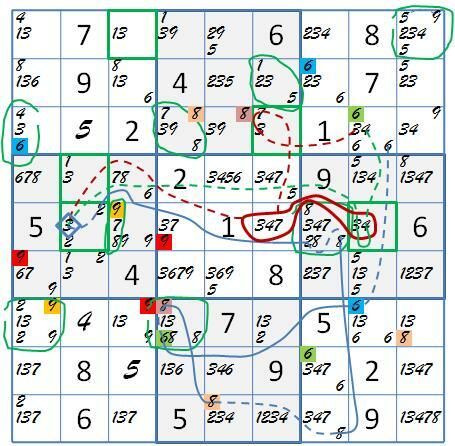 We have some very interesting examples from Unsolvable 40, of all places. They found by Andrew Stuart’s online solver at sudowiki.org, because, as you will see, what human would look for them? Not this one. Do you know about Andrew Stuart’s sudowiki.org solver? You can enter a puzzle, and step through the solver’s order of battle to check your work. This order differs from the SSOB in many ways, but it is close enough to be useful for sysudokies. Currently, Andrew’s solver doesn’t do pattern overlay. On sudowiki.org, the Unsolvable puzzles do not come with solutions, but if you follow the logic solver’s logic all the way, a solution awaits you, even if the techniques used by the solver are not successful. I did that and confirmed a solution that enabled me to find the error I reported earlier. At the point where we applied LPO, the Stuart solver found this triple cell forcing chain removal of 3 in r5c2, generating a 2-clue. The chain starter cell is r3c8. The 3-candidate sees the victim via 347-ALS r5c68; the 4-candidate, via the bv r5c8. Candidate 6 uses a conventional AIC. 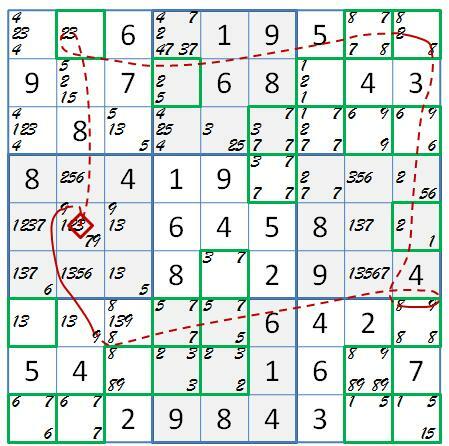 The Systematic Sudoku issue, in looking at what a computer algorithm has found, is whether or not there is a way in which a human can find it with human resources. One factor to consider is that after each step, Stuart’s solver goes back through its entire order of battle. Several steps may be just obvious follow up that a human would do without much thought. Not counting follow up steps, the solver finds three more triple cell forcing chains in a row, then a triple unit forcing chain, before resigning the search. The triple cell forcing chains 1,3 and 4 involve the same starting cell r3c7, and triple cell forcing chains 3 and 4 use the same ALS as the first one. Triple cell forcing chain 2 has starting cell r3c1 and a different ALS, r35c8. My blog hasn’t given you a challenge lately, so maybe you’d like to find these forcing chains for yourself. You’ll know if you are right, and if not, you could enter the clues in the diagram above and step the solver through the forcing chains. Otherwise I’ll provide these in the next post. Finding these cell forcing chains is a lot harder without the above information, especially if you don’t know they are there. A comprehensive human search is impractical. On the grid of the first triple cell forcing chain there are 25 cells with three candidates. Chains from half of them on the same grid would produce a hopeless tangle. Until organizing principles are discovered, I have to reject cell forcing chains similar to the solver’s #1 above as a human solving technique. Along with the checkpoint, I will have for you a way to capture certain triple cell forcing chains, without undertaking a comprehensive search. This entry was posted in Advanced Solving, Expert Reviews, Stuart and tagged almost nice loop, ALS, ALS aided AIC, cell forcing chains, forcing chains, Unsolvable 40. Bookmark the permalink.